The Muranese may be more widely known for their legendary glassblowing mastery, but the glassmakers in a region that is now the Czech Republic have been every bit their equals at turning silica into opulent design objects, which have been made here since the Middle Ages. Thanks to the unique composition of the soil in this mountainous and forested land, once called Bohemia, the glass rivaled Venetian cristallo for clarity and surpassed it for stability. Even today, artists as varied as Karen LaMonte and Roni Horn have their large-scale cast works fabricated nowhere else, because even the most advanced industrial engineers can’t match the Czech experts at the unforgiving formulations, mold-making, and annealing cycles necessary to realize impeccable glass objects at monumental size. This issue of Glass features two very different artists hailing from this Central European glassmaking powerhouse, and they could not be more different. 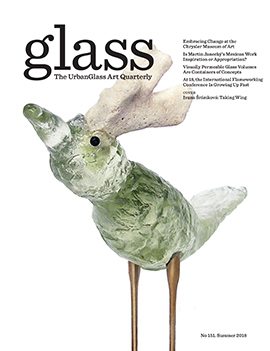 The cover article is concerned with the fanciful birds of Ivana Šrámková, an artist who studied with the legendary professor Stanislav Libenský, perhaps the most important cast-glass artist in the world, whose large-scale sculptures would impact American Studio Glass when Dale Chihuly and others were awestruck at the 1967 Montreal Expo. Libenský’s former student, Šrámková, works in a variety of styles, but her bird series is deceptively simple, fusing antique relics with their perfect counterpoints in cast glass to create a whimsical avian world of thinly veiled human caricatures. There is more than cartooning at work here, as contributing editor John Drury points out in his cover article. Šrámková’s use of found objects gives the birds the role of magical artifacts of another time and place. Contrast Šrámková’s academy training to her fellow Czech Martin Janecký, who is the ultimate self-taught Czech glass master. Born into a family of glassmakers, he went to work in the glass factory at the age of 13. In his 20s, he went from production glass to pioneering new ways to hot sculpt, effectively bridging the Venetian and Bohemian traditions by manipulating both the interior and exterior of the glass bubble. He has been able to achieve unprecedented realism in freehand blowing and sculpting. Janecký has been searching for how best to deploy his unparalleled skills, and he may have found it in new work that mines the rich tradition of the Mexican Day of the Dead. Glass contributor Allison Adler went to review the New York exhibition and decided it was a perfect opportunity to discuss the boundaries between inspiration and appropriation that often arise in work in glass. Elsewhere in this issue, we look at the Chrysler Museum of Art as it regroups after high-profile departures in its glass departments. We are proud to also present an analysis of the state of flameworking by an expert observer, artist, and educator Amy Lemaire, who has been examining this glass culture for two decades. 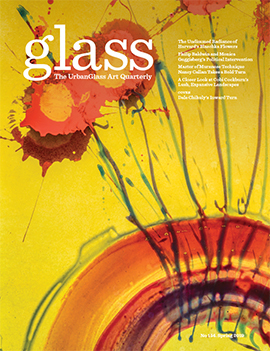 And finally, contributing editor William V. Ganis considers the power of glass volumes to become conceptual frames—either literally, in the form of encasements, or figuratively, in how they elicit an awareness of optical perception, something no other material can achieve so effortlessly, or with such power. 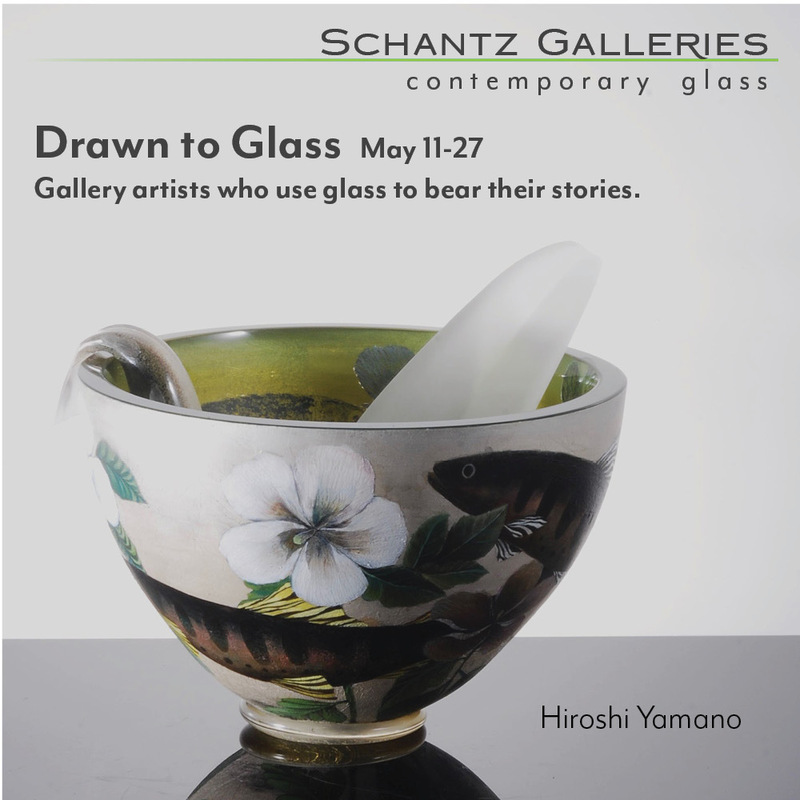 Remembering Glass contributing editor James Yood; the American Craft Council names Sarah Schultz as executive director and inducts artist Beth Lipman as fellow; a long-standing exhibition-in-print, Corning’s New Glass Review will expand to include a major museum exhibit in 2019; a Philadelphia museum seeks to join the visual and the auditory in “Sound + Vision”; Pilchuck’s new executive director, Christopher Taylor, is former head of prominent ceramics nonprofit; Clay artist Sharif Bey exhibits oversized necklace sculptures that incorporate glass at the Pittsburgh Glass Center. Ellsworth Kelly at the Blanton Museum of Art in Austin, Texas; Akio Takamori at the Museum of Glass in Tacoma, Washington; Carole Frève at Espace Verre Gallery in Montreal; Robin Winters at Marlborough Contemporary in New York City. Czech artist Ivana Šrámková’s birds are cast-glass symbols of personal and olitical freedom that she artfully pairs with weathered found objects to develop an enchanting aviary of timeless creatures with human-like personalities. When employed as a solid but visually permeable container, glass can be a powerful conceptual vehicle for works exploring perception. A report from the Internatiional Flameworking Conference, which turns 18 this year, reveals a maturing—and increasingly diverse—field. Can the Chrysler Keep Cruising? The regional art museum that harnessed the power of glass to boost its visibility and attendance has seen recent departures of key personnel. A closer look at what this will mean for its prominence in the glass arena.